When my new friend asked me what my plans were for our October school break, I replied, “I’d like to go to Cappedocia, Turkey.” She looked at me and said, “I’ve always wanted to go there. Let’s just do it!” So we did! – along with several other friends from my school. In the days prior to departure, I read as much as I could on the odd geographical formations called fairy chimneys. As our tour guide explained, three nearby volcanic mountains erupted over time, centuries ago. Each “spewed” different kinds of lava containing different kinds of minerals. Earthquakes happened. There was ice, next a flood and this area was covered in water. Then rivers and tide pools formed. When all the water went away, a bizarre landscape was left. There are a variety of these odd phallic, stone towers, but many of them are made from minerals that are soft on the inside and hard on the outside. Thousands of years ago, communities were formed as people scraped out the inside of these caves to live in. There are thousands of these caves dotting the mountainous landscape and inside some of them are marvelous Christian frescoes that are centuries old!! It’s hard to imagine how these people had thriving neighborhoods on the face of a mountain, but they did. They didn’t have the advantage of helpful wood and steel staircases up the mountain. After arriving and finding our cave hotel, we rested a bit before going to a performance called Turkish Nights! Food and drink was provided, as well as a live band. We watched all kinds of traditional Turkish dances performed in stunning, traditional costumes. I’m guessing because our group was all women we got a lot of attention from the wait staff. Two members of our group were selected to participate in a few of the evening’s performances! Afterwards we went back to the hotel to sleep in our cave. The next morning our group booked a private shuttle van with a driver and tour guide. We spent the next nine hours (!) exploring the Cappedocia region. We parked at beautiful lookout spots that allowed us to step onto the edge of panoramic views that looked a bit like the Grand Canyon, with the added delight of fairy chimneys. We went on a tour of a fascinating onyx factory and learned about this unique, transparent stone, as well as learning the meaning of Cappadocia: land of beautiful horses. We had a lovely lunch next to a bucolic creek, saw the geographical area that was the inspiration behind some of the Star Wars scenes, climbed up rocky paths and peered into caves that ignite imaginations. We also went to Derinkuyu, an enormous underground city. The following day was a holy day for Muslims. It is called Kurban Bayram. This is the day of sacrifice and all over the world, Muslims will sacrifice a sheep or a goat and share the meat with people in need. Although this holiday has special significance to them, I had to be careful as we walked past little stone homes in quaint, rocky villages, not to see the remains of the slaughter. After a long day of traveling and exploring, we ate dinner and went to bed promptly because the following morning we had to be up at 5:00 am to catch our shuttle to Butterfly Balloons! There are hundreds of hot air balloon companies in this area, but my favorite travel guru, Rick Steves, used this company last year when he toured this area so this was the company I wanted to use. Everyone here in Turkey knows that you simply MUST go up in a hot air balloon if you find yourself in this part of Turkey. I was a bit frightened to think about it, but because of the insistence of everyone who’d been here I decided that I would do it. Once we arrived at the take off point, next to the gigantic canyon, it was dark but we could begin to see the silhouettes of balloons starting to fill up. After shooting some pictures and wiping the sleep out of our eyes, we were loaded in the basket and off we went. It was not what I had imagined. This balloon ride was the most peaceful, slow and relaxing ride I have ever been on. It was breathtakingly beautiful! Our basket was large, holding about 16 people. Our pilot, Mustafa, has been written up in Trip Advisor as simply one of the BEST pilots, and he proved to be very cautious and experienced. He was able to maneuver the gigantic balloon down into the cavern right next to the chimneys and rock formations. He was also proud to tell us that we were the highest balloon in the sky at 6300 meters! As we peered over the edge, we could see colorful dots beneath us. These dots were the TOP of other balloons. We stayed up in the sky for over an hour, Mustafa gently guiding our balloon to all different parts of the canyon. What an amazing experience! It is customary to be served champagne upon landing, but Butterfly Balloons had more planned. I still don’t know how they knew this, no one took any credit, but as a complete surprise to me, they knew it was my birthday on that day and I was presented a beautiful chocolate cake, and flowers, to be shared by everyone in our basket! One man on the ground crew threw me across his shoulders like a sack of potatoes and then all the ground crew gathered around while he tossed me into the deflated balloon for pictures. It was amazing; a birthday like no other. When we arrived back at the hotel, it was just 9:00 a.m. so we ate a quick breakfast and then went back to bed for a few hours. When we got up for the second time, all us girls decided to go to a Turkish Bath (hamam). I hadn’t yet been to a Turkish bath, although they are very popular here in Istanbul. Baths have been a part of this culture for centuries and many hamams are very old. We enjoyed a sauna, a swim in a mineral pool, and then a scrub down. It was quite an experience and we were left invigorated afterward. After lunch and a little shopping, we relaxed until the evening. 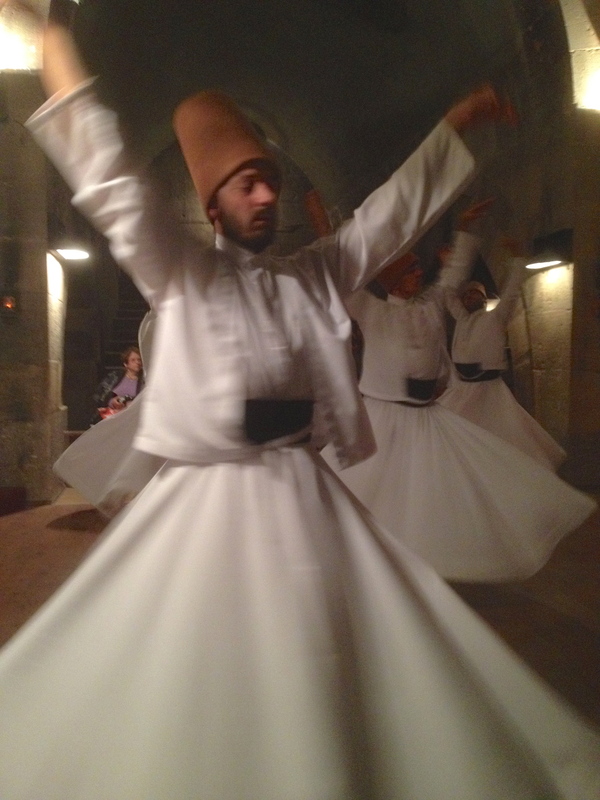 Several of us went to a Sufi worship center and watched a Whirling Dervish ceremony. Prior to arrival we read about the symbolism of the performance. On the website called The Whirling Dervishes of Rumi we learned about the dress, the hand movements and the sounds played by the musicians. I really loved watching this trancelike, harmonious, worshipful dance. The Mevlevi Sufi order was founded to follow the teachings of Rumi, one of the great spiritual masters, and poets, of the 13th century. If you are interested in learning more, I’ve just finished reading a novel by Elif Shafak called, The Forty Rules of Love, and through this story, Rumi’s biographical story is told. It is fascinating and I highly recommend it. The colors, sounds and textures of Cappedocia are totally worth exploring if you find yourself in this part of the world. Anita, what a wonderful experience! The balloon ride sounds like something I would love to do. I know you are having an adventure. Thanks for the post. 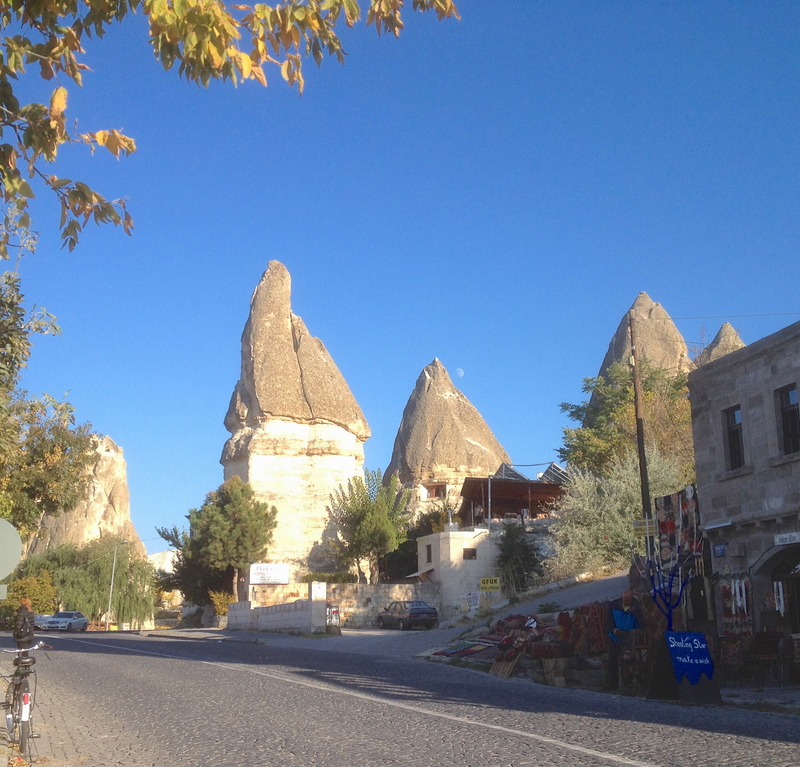 Your fabulous getaway was similar to part of my summer journey through Turkey….the trek around the geological wonders in Cappadocia, the Turkish dinner/show and Whirling Dervishes. I bet I know the hamam you went to with the mineral baths and huge circular marble ‘table’ to await being washed. Turkey is captivating in all there is to see. Enjoy. ….it’s fun for me to follow your journey and relive my own. Thanks. Anita.. I thoroughly enjoyed reading about Cappedocia!!!! I am so glad you took the time to specifically explain your experience . Simply awesome! Amy, it is so good to hear from you! Thank you for writing! I am very happy. I’m going through a big learning curve teaching in an international school, but so very worth it! And on the weekends there’s sooooo much to explore! Give my love to all your boys!